incorporates real gold or platinum. Glasses with a gold or platinum rim or print have a beautiful and exclusive appearance. For this we use an ink that incorporates real gold or platinum. Ayano is one of the few companies that can apply a gold/platinum rim to glasses mechanically, which enables us to produce larger editions faster. We would like to think with you about the best option for your company. Please do not hesitate to contact us. 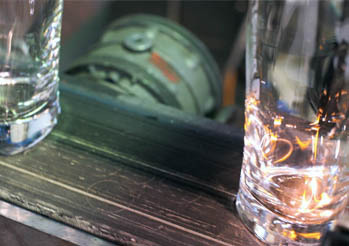 When using laser technology, it is possible to create an image such as your logo in both the glass bottom and on the outside of the glass. 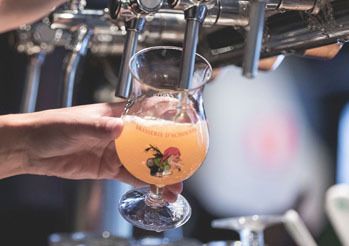 When a logo is applied to the bottom on the inside of the glass, this results in an effervescent effect which keeps the drink fresh for longer. 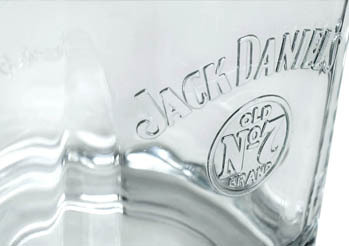 By providing glasses or bottles with relief printing, your logo is not only visible, but one can also feel it. This gives the glassware a special appearance. Ayano uses several techniques for printing glass, porcelain and earthenware and we are able to advise which technique best suits your requirements. With our advanced machinery, we can even decorate square or oval glasses and bottles so we can meet every decorating challenge.